Thanks to the latest Media Create White Book, we have plenty of sales data for the Japanese market in 2016. And by plenty, we actually mean a ton: the Top 1000 Software (yes, one thousand! ), Hardware sales, top publishers, and more. Let’s start with the Top 20 of publishers, and unsurprisingly, Nintendo was #1 by a wide margin with 5 208 950 units sold and a 16.19% market share. If we add The Pokémon Company’s sales, then we get a 27.18% market share, which is really significant: that means over 1/4 of total Software sales are either from Nintendo or a very close partner. Due to much lower sales than expected for Yo-kai Watch 3, Level-5’s market share dropped sharply in 2016… but it’s nothing compared to the expected drop for 2017. To the surprise of no one, the Nintendo 3DS was the most successful platform with 14 780 505 units sold… that’s almost 50% of total software sales! This does show how weak the Japanese dedicated game market is, with only one truly healthy platform, one moderately successful platfom, and two failures. 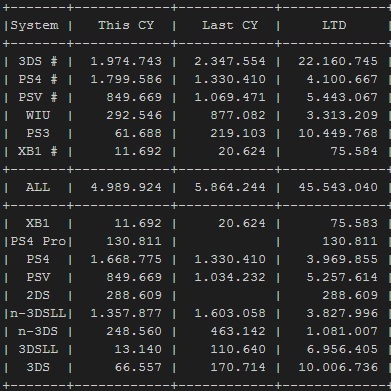 As for Hardware sales, the Nintendo 3DS dominated them once again, but the PlayStation 4 wasn’t that far behind. Sales did drop last year, but at least the drop was somewhat limited for such an old platform (about 400 000 units). As for the Wii U, sales did collapse, but that’s not a surprise to anyone as Nintendo purposefully kept stocks low throughout most of the year. Now, you’re probably wondering where the 900 other games are (since we did talk about a Top 1 000), and the answer is… on this page! There was simply too much for us to copy/paste here, especially since we were not the ones to transcribe the data in the first place. Finally, some more data about the Top 1 000 Software. Believe it or not, the PlayStation Vita was the platform with the most games in the Top 1 000, thanks to the many niche releases rarely selling more than a few 10 000 units. The Nintendo 3DS isn’t that far, though… but the same definitely cannot be said about the Wii U, which has less games than the PlayStation 3! And as you can see below, the games at the top of the chart really makes the vast majority of sales. The Top 500 games account for 94.73% of total Softwae sales in 2016, leaving only ~4% for the remaining games.